Apologies for the delay in getting these week 7 rankings out. It's been a busy week for me and I've been away from a computer for most of it, so only just gotten the time to sit down and watch these games properly. 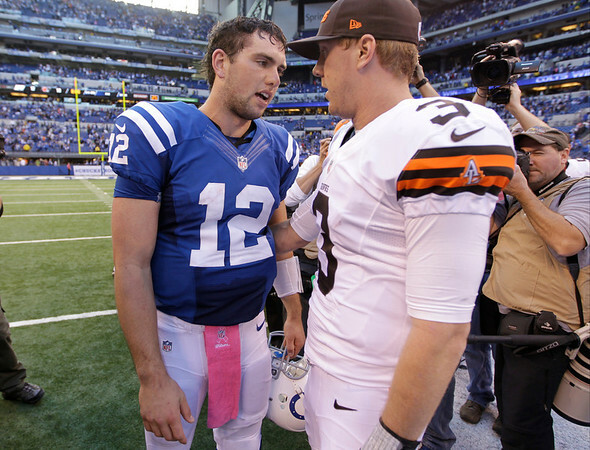 Week 7 saw out first rookie vs. rookie match-up as Brandon Weeden took his Browns into Indy to face 1st overall pick Andrew Luck and the Indianapolis Colts. Meanwhile Russell Wilson traveled to San Francisco for a TNF divisional matchup against the 49ers and Washington's Robert Griffin III was also against a divisional foe, the defending champion New York Giants. Griffin opened the game with a 17 play, 88 yard drive for a field goal that actually featured a touchdown pass to Josh Morgan that was taken off the board due to an illegal shift. Those 4 points turned out to be crucial in the outcome of the game. The first drive was exactly what the Redskins offense has been doing all year, run-heavy, short passes off play action. Griffin leads the league in completion percentage because of the style of offense that they run, but that shouldn't take away from his innate accuracy as a passer, be that on short slants and outs or deep crossing patterns, he's just as dangerous and effective with both. But he's not yet at Eli Manning's level. Griffin's first (official) touchdown of the game came on a 26 yard WR screen to Santana Moss that featured great blocking from all involved (which wasn't Griffin). So there's not much to praise him for on the TD itself, but the drive featured a nice designed run from Griffin in which he smartly went down after getting the first down, and featured some more fantastic play-fakes by Griffin. He really commits to the play whether he has the ball or not, which causing a lot of confusion on the backside of plays and really slows the backside pursuit when Griffin doesn't actually have the ball. Griffin did fumble a QB read in the 3rd quarter, but the ball sat at his feet and he was able to collect it and still outrun the defense to the edge and gain 5 yards. Unfortunately, on the very next play Griffin lead his TE too much over the middle and it was an easy interception for the safety as the ball hit him between the numbers. In the 4th quarter the Redskins found themselves down by 7, but Griffin was masterful on a drive, converting a pair of fourth downs with a fake QB draw and then a rollout in which he pumpfaked a defender and then outran him to the sticks. But straight after that he tried to zone read Jason Pierre-Paul who is simply too good an athlete to do that to. JPP wrapped him up and knocked the ball out. He lucked out with his defense intercepting Eli Manning on the very next play, so it didn't cost them even any yards, but it was lost time, at a point where time was all important. But Griffin saved the best for last, a 4th & 10 scramble left with a twist before finding his TE for a 1st down, and then capped it off with a rainbow of a touchdown pass to Santana Moss. But for the Redskins defense allowing Cruz behind them in a must-throw-deep situation, it would have been the game winning TD. Fumbles ended up killing the Redskins in a game they should have won, but Robert Griffin III continues to put in superb performances, and making a mockery of the 2 1st round picks they gave up to get him. An up and down day for Andrew Luck, while he committed the only turnover of the game at an extremely inopportune time, he did overcome silly penalties to score on the opening 2 drives, progressed through his reads well and taking the check down when he had to before running the first one up the middle and the second was a stroll into the corner on a bootleg that opened up in front of him. Luck's ability to slide in the pocket with ease and continue to scan the field is on a par with 10-year verterans, and is a huge part of why I continue to prefer him to RG3. It was on display again in this game as Cleveland started to throw blitzes against the weak Colts line but the majority of the time Luck was able to react and slide away from the pressure while keeping composed enough to find passes down field. The turnover was perhaps unfortunate for Andrew Luck. On a roll out, mid-way through the 4th Q he fumbles and loses the ball at midfield after stopping on his rollout to avoid the hit in front of him, only to get nailed from behind. This is perhaps a lack of awareness on Luck's part, he needs to be aware that there's almost certainly a rush coming from behind him and if no one's open he should throw the ball away quickly. However it is Sheldon Brown, a cornerback, who hits Luck from behind, he's almost certainly not expecting the hit to come that quickly, as he would expect a larger, slower defender to be chasing him. But it was still an avoidable play, and one that very nearly cost the Colts the game. With Trent Richardson injured and playing at half speed it was a tricky day for Weeden, who can usually rely on the ground game. But like Luck he was very poised on the opening drive (although he was almost intercepted at the 3 as he tried to force the ball over the middle). An opening TD was taken off the board on a throw to Ben Watson, but Weeden was able to put the ball up and give Greg Little on the very next play and give his receiver the chance to make a circus catch, which the normally drop-ridden Little did, to his credit. On the first drive of the 2nd half Weeden throws a beautiful ball off a big play action to Josh Gordon. It was a training ground throw as there was literally no one near Weeden, not even one of his own offensive linemen. And with all that time and space Weeden could deliver to the outside shoulder perfectly and throw Gordon open. It's a fine example of the ability Weeden has, and why he was a 1st rounder despite his age. But then again, with that kind of time and open field you would expect any professional QB to make a similar throw. Coming off of Luck's turnover in the 4th quarter, Weeden was on the money with a long bomb to Josh Gordon once again only to see Gordon drop it at the goal line. It would turn out to be a crucial drop as the Browns would get just 1 more drive from worse field position and ended up losing 17-13. Weeden continues to look impressive when given time and space, but in a tight pocket, when he can't step up he looks poor. I'm still on the fence about his ability to be a long-term solution to the QB position for Cleveland. It was very hard to separate Luck and Weeden in this game, Weeden had the 2 touchdowns, and almost a 3rd, but he threw a bad ball that should have been intercepted on the opening drive and would have taken 6 points (they botched the XP) off the board. He threw into a lot of tight coverage and was guilty of a few misses without being pressured, which Luck was not. The stat line looks ugly: 9/23, 122 yards, no TD's, 1 INT and 2 sacks. And when you look at that, and consider that it was on the road, in primetime, and against an elite defense, you might not be surprised, and suspect that Wilson just had a really bad day. But truth be told he was good in this one and his receivers simply couldn't hold onto it. I counted 6 drops that would have resulted in 1st downs (some of them long ones) and very possibly a touchdown too. When you factor in that most of those passes weren't just "tough ones that maybe should have been caught" but actual legitimate balls that hit them in the hands and needed to be caught. rough night for Seattle's pass catchers. It's tough to point to a "biggest" single drop, as the potential touchdown to Robert Turbin down the sideline was on their opening drive where as some others occurred at a more crucial time, in the 4th quarter, but would have only gotten a 1st down when in the shadow of their own goal posts. The interception was really the only bad moment for Wilson in this one, he stood in against a Patrick Willis blitz but, knowing the pressure was coming, decided to hurl it down field to Braylon Edwards when he had 3 9ers buzzing around him. The throw wasn't that close to Edwards and was an easy interception for Dashon Goldson. Around that, Wilson once again showed good decision making and mobility. It's clear to me that you can run a successful NFL offense around him, if he didn't have an O-Line that committed so many penalties and receivers who could actually catch the ball.